For those of you interested in participating in system-config-printer development, I invite you to join the new mailing list. I’ve just released version 1.2.1 of system-config-printer. One of the changes is that it now uses the D-Bus API of the Fedora firewall tool to actually make firewall adjustments that it needs. 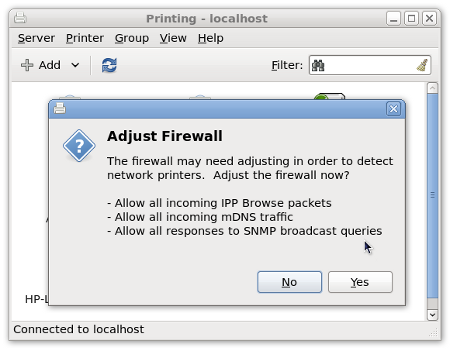 Just a quick note that I’ll be presenting by phone today, Thursday 15th April, at the OpenPrinting Summit on the topic of automatic printer driver installation in Fedora 13. The talk is at 1600 UTC / 1700 BST, and was not Wednesday as scheduled. The schedule hasn’t been updated yet, but when it is you can find it and the dial-in information here. The new feature in Fedora 13 for installing printer drivers automatically makes it all the more important to have correct IEEE 1284 Device IDs for printers. Unfortunately many drivers shipped in Fedora do not declare Device IDs for all the printers they support, and some of the ones we do have are wrong. You can help put this right, whether you are running Fedora 13 Alpha, or Fedora 11/12. You are currently browsing the PRINT HEAD weblog archives for April, 2010.